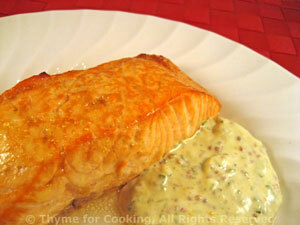 Salmon with Tarragon Mustard, Thyme for Cooking gourmet main course. In a small bowl mix sugar, lemon, soy sauce, wine and oil. Put the salmon, skin side down, in a baking dish. Pour marinade over and let marinate for 10 - 20 minutes, spooning marinade over periodically. Mix all ingredients, at least 10 minutes before using.